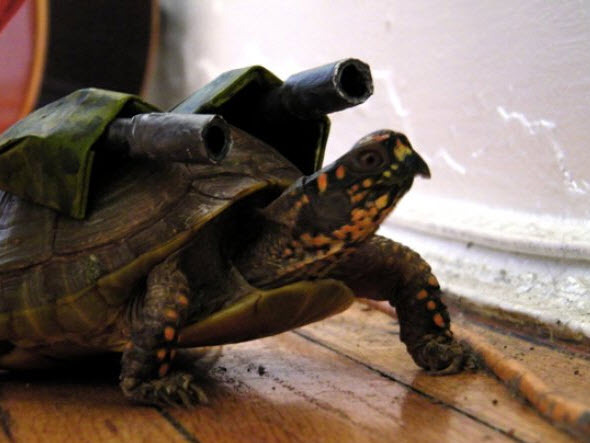 Dress your turtle or tortoise as Blastoise for Halloween or for a Pokemon convention! Get a rectangular plastic container and cut it in half through the long sides. Paint the plastic container to look like camouflage or similar to your turtle’s shell. Cut two small pieces of PVC pipe to make the gun barrels, glue a small PVC connector into one end of each barrel, and paint them black. Glue the PVC connector to the inside of the camouflage shell pieces. Attach the guns on your tortoise’s shell with nontoxic modeling clay.